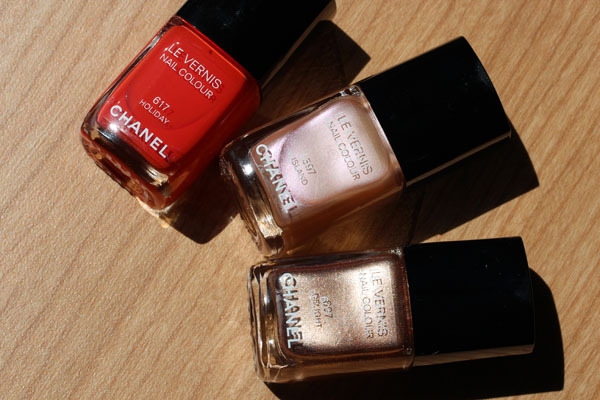 Apart from Calypso, the only other items from Chanel's summer collection that dazzled me were its nail polishes. Chanel released three shades, Holiday, Island, and Delight, and I snatched them up gleefully. While I love the ubiquitous blue polishes that every brand seems to be releasing this summer, I have to admit these are a welcome change. 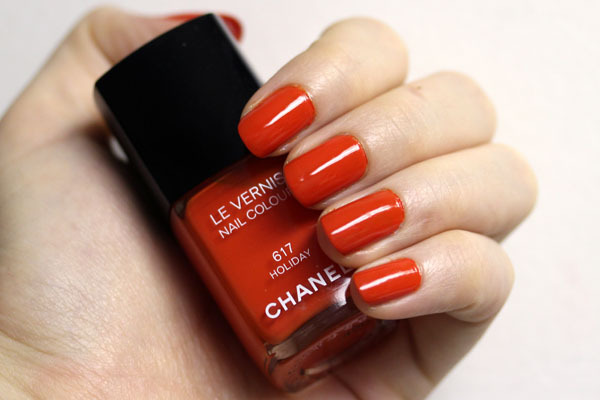 Chanel Holiday is a vivid orange. It is such a bright, jolly shade that I'm almost afraid to look at it for fear of hurting my eyes. They make your nails stand out and is a good alternative for red this summer. The formula for Holiday is a little thick (am I the only one having trouble opening Chanel's recent nail polish bottles?) and was not the easiest to apply. The first coat looked horrendous but the second smoothed it out. Chanel Delight, on the other hand, was marvelous to apply. It flowed on smooth and could have been a one-coater if I was diligent enough. The shade is a shimmering light gold, like the color of aluminium foil if it were gold instead of silver. While some say it is comparable to Graphite from last fall, I personally think it's more similar (and superior) to Gold Fingers. 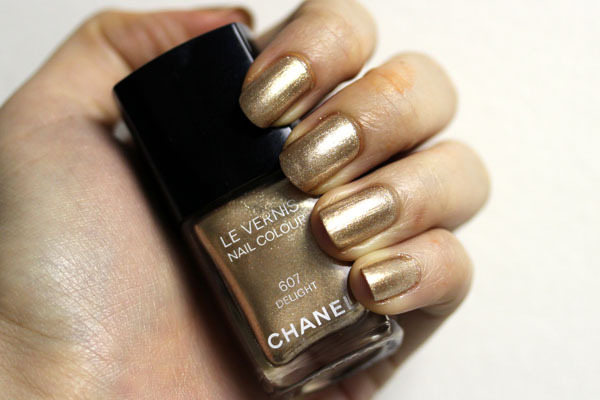 Chanel Le Vernis Holiday, Island, and Delight retail for $26 and is available at all Chanel counters. I purchased mine from Chanel.com. I love these Chanel shades :-) Thank you for posting! Love Holiday--- I've been falling so easily for orange based reds. I wonder how this compares to NARS Lal Mirchi? Where's Island, my dear? I wanna see, too! Holiday is absolutely gorgeous <3. Please post Island... mixed feelings on this polish. Thanks. I want Delight! I really do. Chanel has kind of been killing me with their polish this year - usually I'm indifferent, but I really loved June from spring and now I want Delight! Looks like Dovey and I are the minority who are loving Holiday! Gorgeous! !